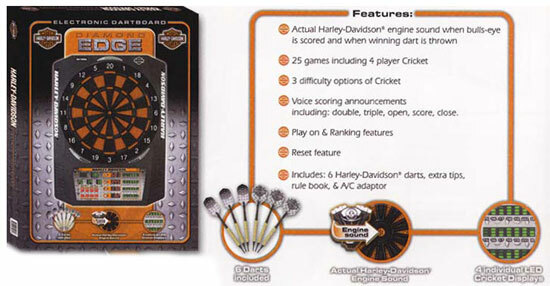 You'll get revved up playing Harley-Davidson's® Diamond Edge Electronic Dartboard. When you score on this bulls-eye or you shoot the game winning dart, you hear the sound of a Harley® revving. This is a top quality electronic dartboard, highlighting the most popular games played today. In addition to the special bulls-eye feature, the H-D® Diamond Edge Dartboard has many voice scoring announcements including: Double, Triple, Open, Score, and Close. The Diamond Edge Electronic Dartboard is ideal for both the beginning and seasoned player and sets itself apart from ordinary dartboards with a bulls-eye that rewards your scores.